The iconic baby brand celebrates a strong dad-baby bond, and science backs it up. A new viral video from Pampers starring John Legend and his kids — building on Legend’s popular “Stinky Booty” song — makes a strong (and pretty sweet) statement about the changing role of fathers in our culture. The video features Legend changing his baby son Miles, with his toddler daughter Luna (the original muse for the song) adorably assisting by handing him wipes, before the camera pans out to a large posse of other “baby wearing” dads, operatically belting out Legend’s song. The dads part to reveal Maroon 5’s frontman Adam Levine, a father of two, leaning over his youngest daughter on a changing table, promising, “Daddy’s gonna clean it up.” Then the front door opens, and in walks Chrissy Teigen, finding herself in the middle of the joyful, celebratory scene. Sure, the spot is cute. But it also captures a monumental shift in American culture in which dads are owning the parental reins with as much gusto and competence as moms. In fact, 21st century iterations of fatherhood and motherhood have converged and melded into something decidedly less gender-specific and far more democratic. Pew Research Center surveys from 2013 to 2017 underscore just how substantially the role of dads (and society’s attitude about them) has evolved. For starters, dads today are just as likely as moms to say that parenting is extremely important to their identity. And dads are much more involved in child care than they were 50 years ago. The number of stay-at-home dads has soared from 1.1 million in 1989 to 2 million in 2012. And 7 in 10 adults say it’s equally important for new babies to bond with their mother and their father. These radical shifts in perspective didn’t just happen overnight — they’ve been slowly gaining momentum over the last two centuries, Stephanie Coontz, Ph.D., a family historian and director of public education at the Council on Contemporary Families, tells Thrive Global. It all harkens back to first wave feminism in the 1800s and the rally for women’s right to vote, which launched women’s efforts to stake a claim on life outside the home. “Over the last 200 years, and even further back in history, rigid gender stereotypes denied women access to a sense of meaning and competence outside the home,” Coontz says — and that reality limited opportunities for men to access and act on their nurturing sides. “There’s nothing natural about that old arrangement,” she points out, noting that historically, in hunter-gatherer societies, men assumed central caretaking roles in their children’s lives. The transformation we’re currently witnessing really gained traction with second wave feminism during the 60s and 70s when women entered the workforce en masse. It reached a crescendo in recent years when women began earning the larger share of college degrees (60 percent in 2012), and during the Great Recession of 2008, when men lost the highest percentage of jobs, allowing many of them to assume a larger role in their family lives. “In the 70s when women went back to work, there was an awful lot of outcry about whether fathers staying at home was good for babies,” says Kyle Pruett, M.D., a clinical professor in the Child Study Center at Yale University, who debunked dad doubters with his pioneering work in the 80s, showing the uniquely positive impact fathers have on infant and child development. “My early work proved that fathers could be not only competent caregivers,” but that kids weren’t damaged when moms went to work. And since then, science has continued to back him up. “The panoply of benefits to infants and children from active father involvement right from birth includes improved social competence, language skills, motor development, cognition, and decreased risk behavior,” Michael W. Yogman, M.D., chief resident in the division of ambulatory pediatrics at Mount Auburn Hospital in Cambridge, MA, tells Thrive. The benefits of the dad-baby bond aren’t only for the child — they extend to fathers themselves. “Since becoming a father can be a transformative experience,” Yogman says, “men become better motivated to take care of themselves.” Like mothers, research shows that fathers experience a surge in the love hormone oxytocin in the early phases of bonding with their babies. “When oxytocin levels are high, fathers are feeling very much in love with their infants,” Yogman says. 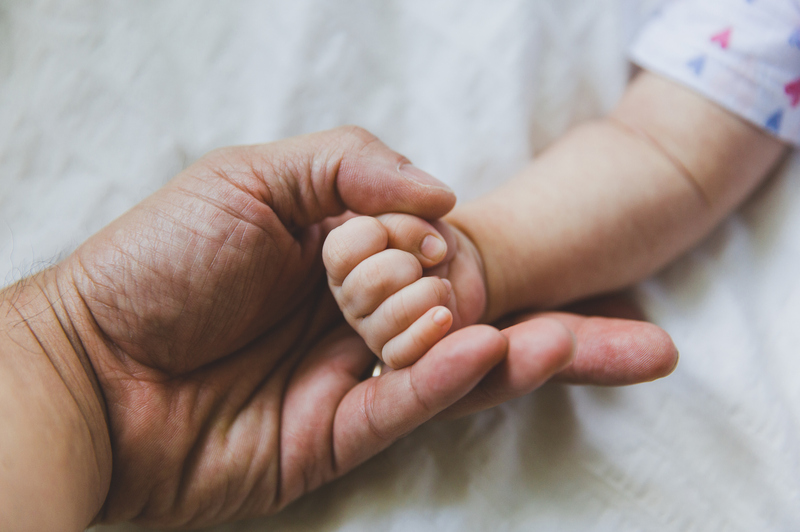 To help maximize these benefits, we tapped our experts for their best small tips — we call them Microsteps because they’re tiny changes that you can start implementing today — for how to crystallize your bond with baby. Singing your way through diaper duty, as Legend does, reduces the stress hormone cortisol in babies. It also promotes closeness and social bonding, according to a 2018 study in Music and Science. Listening to music with your baby can also increase their language and music acquisition skills. So cue up your playlist and sing along. Infants may seem like they’re not aware of their surroundings, but they can hear a parent’s voice and distinguish it from a stranger’s. Studies also show that talking to your baby influences their future language development. Craig Garfield, M.D., an associate professor at Northwestern University Feinberg School of Medicine, adds that dads usually use different language than moms and assess the world through a unique lens, which helps expand children’s points of view and understanding. Maybe it’s a special nighttime ritual, Garfield says, like giving your baby a bath or reading a specific book to him or her. Whatever it may be, consistently create space in each day that’s dedicated to cultivating and deepening your bond. This article was produced by Thrive Global and sponsored by Pampers.